How's everyone doing, brothers and sisters of the Mitakihara Family, the greatest nonviolent mafia in the world? I am your peace-tolerant hitman Gir Todafunk, Mr. Wonderful, here with another weekly columbn for the daily Magi. Just one week away from the season starting once again here in Mitakihara Town, Can you feel it? I know I am. So here is the final part of my dissertation on the cornerback position, highlighting single/man-to-man defense. This man to man technique is very similar to the man up technique described below except there is not a free release. The corner usually attempts to force the receiver toward the near sideline and jam him in order to prevent him from running toward the inside or middle of the field. To do this, the corner lines up as close as possible to the receiver without being penalized for being offsides. This coverage is used in goal line situations, as well as when a blitz is called. During this coverage, the corner does not have anyone to help him cover the receiver if he runs inside because his usual help is blitzing or in single coverage as well. Loose man requires cornerbacks to play off the receiver with a five to ten yard cushion. He usually does not touch the receiver and tries to keep his head on a swivel while remaining indifferent upon which direction the receiver decides to shape his route. Typically with loose man coverage, the cornerback has little or no help from the safety in defending against the receiver. This defense is used to discourage deeper passes but often allow short yardage passes. A loose-man defense looks to create confusion for the quarterback by using blitzes. The idea is to disrupt the coordination necessary for short routes, and will lead to drops or poorly thrown passes stalling the drive. However, accurate quarterbacks with a quick release of football can exploit this and routinely make 3–5 yard completions to receivers. By far the most challenging, the man up technique grants the wide receiver a relatively free release as the corner shadows him stride for stride everywhere he goes. The cornerback's objective here is to position himself between the quarterback and the receiver, without knowing where the receiver is going. As the ball is snapped the corner will initially ignore the quarterback, turn and run with the receiver and hope the ball does not drop out of the sky before he can react to it. Corners must also hope the receiver does not change directions when it is time to sneak a peek at the quarterback in effort to discover where the ball is. A wet field makes this coverage extremely difficult. In addition, a perfect throw is hard, if not, impossible to stop. This coverage is usually reserved for the elite cornerback with superb coverage skills. At Mitakihara, the man up technique is something we are trained to know and apply from the first day we have camp. Last year, we practiced man up for one week, and I happened to have benefitted from man up last year. You saw all those 28 interception I made? A majority of them were courtesy of the man up technique. I learned, on the first week of training camp, that many great cornerbacks have perfected man up. We've perfected it so much, we're cheesing it to death. So expect to see this at work on your television screen or live, if you're luck to have tickets to one of our home games. By the way, the game against Miami: sold out since May. 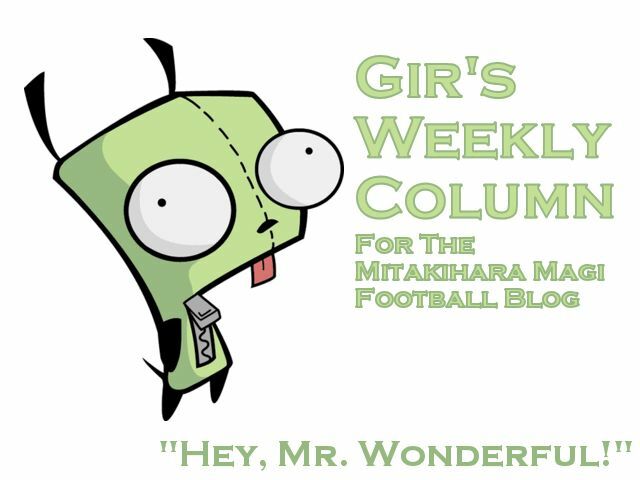 And that is my cornerback dissertation for you wonderful readers on the Daily Magi and Magi football blog. Next week, we're getting close to kickoff. I get to check out some of the preparations going on. Till then, I am Gir Todafunk, Mr. Wonderful, signing off. You are not alone.